My grandma used to make Harvard beets for every holiday dinner, just for me. Perhaps it was the only vegetable dish I liked, but whatever the reason, it became a family tradition. Beets are quite easy to grow, and the greens are a good alternative to spinach in smoothies, so I have several reasons to grow them in my garden. This post contains affiliate links Read my disclosure page here. 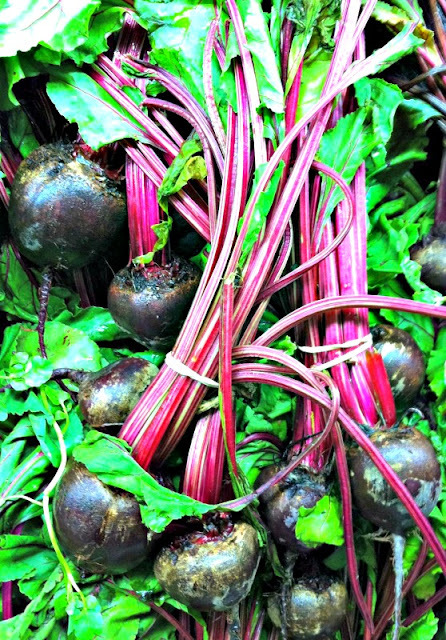 Eating beets can lower your blood pressure, boost stamina and reduce inflammation. They also have anti-cancer properties and are packed with fiber and nutrients. Beets are high in vitamin C, potassium, manganese and folate, a B vitamin. If they're on your list of garden staples too, here is how to can them so you can enjoy their ruby-colored beauty and flavor all winter long. Beets are low in acid so they must be canned using a pressure canner. If you are unfamiliar with the process, you can read my post about using a pressure canner for detailed directions. I've found it easiest to wash garden-fresh beets outside to get the bulk of the soil off before coming inside the house. In the kitchen, cut off the beet tops but leave an inch or so of the stems (and roots) attached to keep the color from bleeding out of the beet. Wash and scrub the beets well. Boil the beets for about 15-25 minutes, depending on their size. Let them cool until you can handle them, the slip off the skins and cut off the stems and roots. Cut or slice the beets into fairly uniform-sized pieces or slices. 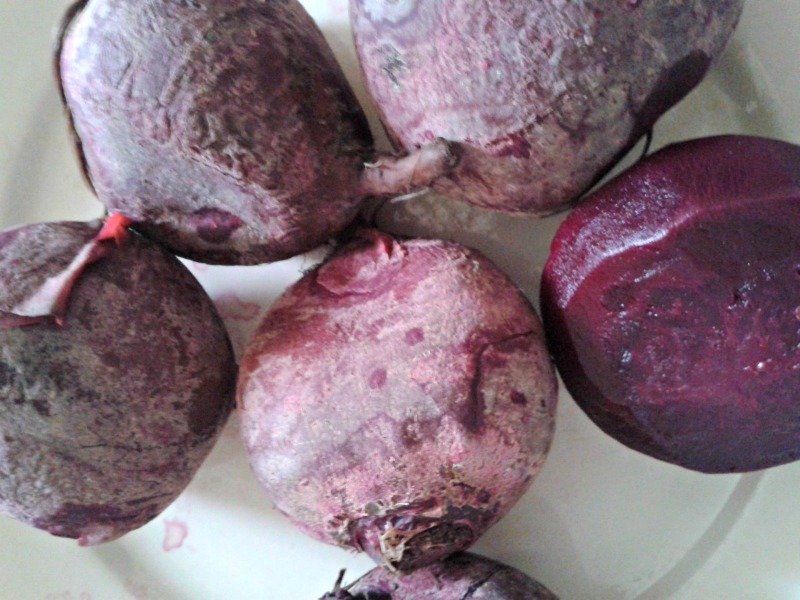 You can leave small beets whole and halve or quarter larger ones. If you're slicing them, cut the larger slices in half or quarters if needed. 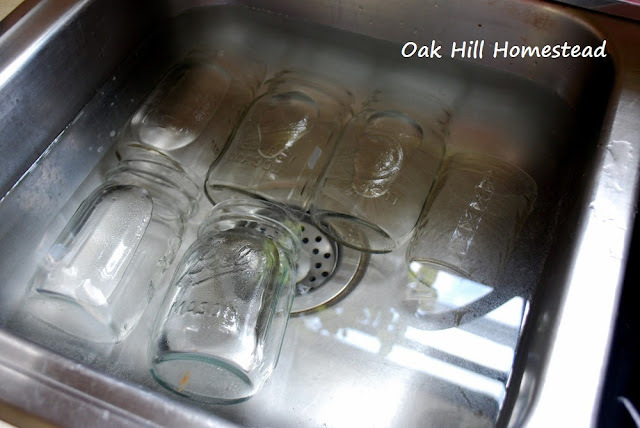 Keep your sterilized jars in hot water until you are ready to fill them. Fill the hot jars with hot beets and hot water, leaving an inch of headspace in the jars. If you wish you can add one teaspoon of salt per quart. Wipe the jar rims with a damp cloth and apply the lids and rings. Tighten the rings to "fingertip tight"; do not overtighten. Place the jars in your pressure canner using a jar lifter. Add the amount of water your owner's manual recommends, then put the lid on the canner. Follow the directions given for your particular canner. This is how I use my Presto pressure canner. 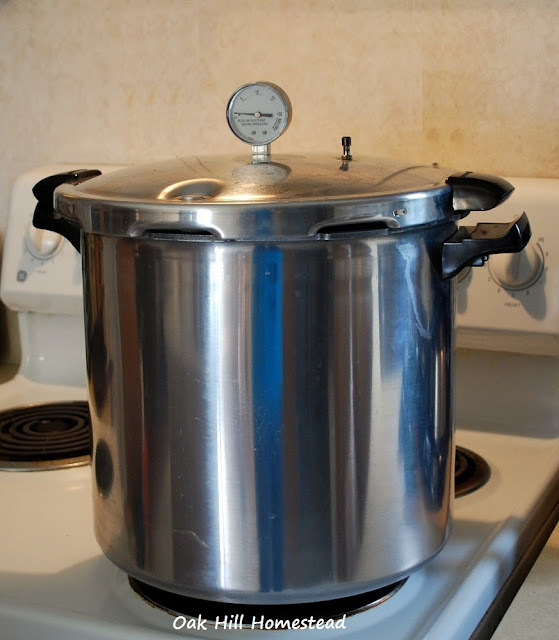 Follow your canner's directions for cooling the canner completely before opening it. Remember to lift the lid of the canner away from your face to avoid being burned by the hot steam. Use the jar lifter to remove the jars from the canner and place them on a towel-covered counter. Leave them undisturbed for 24 hours, then you can remove the rings and wipe down the jars. Don't forget to label your jars - jars of red plums look very similar to jars of small, whole beets on the shelf. Folks seem to either love beets or hate them. Which one are you? I love beets. These look delicious! Me too, Sandra. They're so good! I haven't tried beets yet - I love these are NOT pickled! - so will give this a try! I will have to grab some from the farmers market as I did not grow any myself but well worth it! I'm not a big fan of pickled beets either. I hope you can buy some beets and do some canning... and then maybe make some Harvard beets because they are delicious! I absolutely love beets but have never tried canning them. Thanks for this super informational post about doing so. Yay, another beet lover! It's good to hear from you, Anya. I never thought I can make canned beet with pressure cooker, thanks for sharing the tip with Hearth and soul blog hop. pinning. Yes, you can, Swathi! Thank you for pinning the post on Pinterest.